Continuing on my packing puzzle challenge, the second puzzle I bought from Brilliant Puzzles was Impossible Square. Have a look at my review of Log Jam which was the first of the puzzles in that shipment. Puzzle Crafthouse also have a copy of this puzzle available. Much like the Melting Block puzzle, the goal of this one is to fit the red block into the tray, so that the lid can be closed. 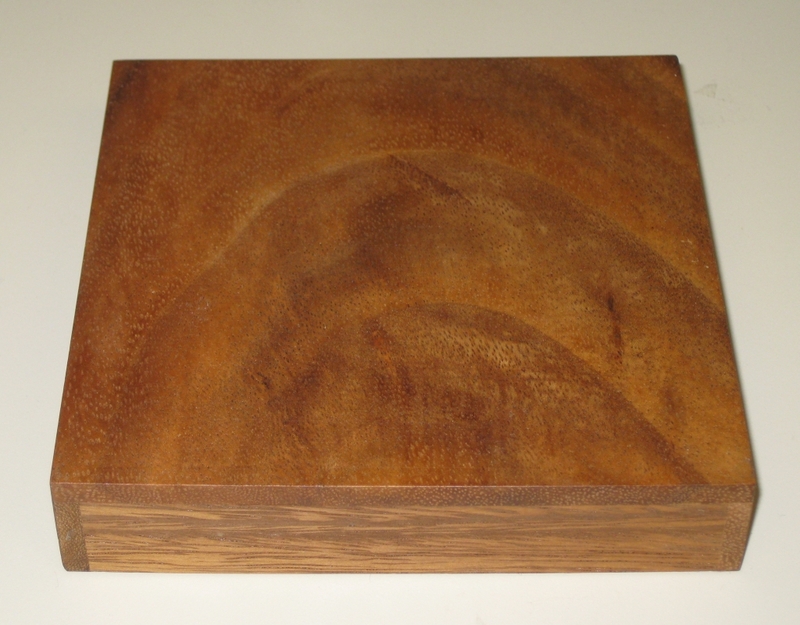 Fortunately, the lid also doubles as a base, so until you solve it, you're not left with a badly fitting box! As is normal with this style of puzzle, at first look there seems to be little free space, and fitting that extra cube in seems nigh on impossible (hence the name). 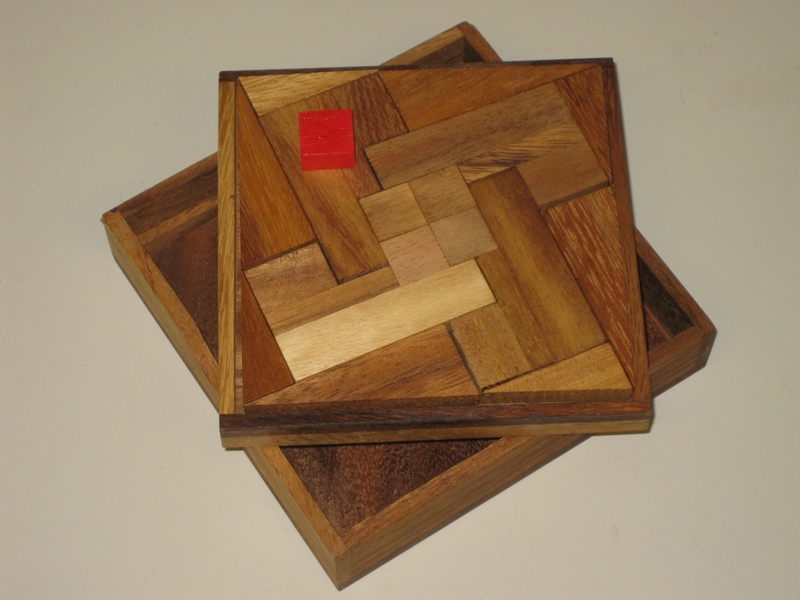 The puzzle measures 5" x 5" x 1.25" and is very well made. The pieces are all very nicely cut and well finished. If I were nitpicking, the tray is a fraction larger than it should be, but really that's me being very picky. It certainly doesn't change the puzzle any, and there are no extra solutions as a result. I found this puzzle fairly straight forward, and it's certainly not one of the more difficult packing puzzles I've tried. I was able to solve it in under 5 minutes, so for me I felt pretty good. As I've mentioned before, packing puzzles are not my forte, but maybe I'm getting better. Having lent this to one of my work colleagues, he also solved it within 5 minutes, so I'll say that this isn't a hard puzzle, but it certainly is a good looking puzzle, and had the effect that it does look impossible to start with, and once solved, it's a very elegant solution. One thing which seems to help with this particular puzzle is the symmetry in the pieces. Unlike a number of other packing puzzles, having a number of identical pieces, limits the number of possible solutions, and I feel makes things easier. Really you only need to solve one corner and then the remainder are copies of that corner. Ok, you really thought I was going to give you the solution? But that said, all pieces are in the box, but you'll have to trust me on that! The puzzle does come with a solution included on a folded sheet of paper so you're not going to accidentally see it, but I honestly don't think you'll need it. If you do, you know it's there. This is a great little puzzle, and well worth the small price that both Brilliant Puzzles and Puzzle Crafthouse are asking for it. It may be quite simple, but it's a great puzzle to hand to new puzzlers to get them hooked!